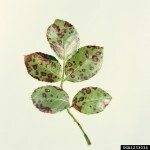 My rose bush got black leaf and we have treated. It’s dropped almost all of its leaves except the very ends on a few stems. Should we cut back all the stems with no leaves? Your rose should push forth new leaves. If you have them on a normal fertilizer schedule, add an extra dose of liquid fertilizer now. Pre-treat the new leaves to prevent black spot. Remove all plant debris from under the shrubs including mulch. Put down new mulch, 1-2 inches but not near the plant base. Consider removing the lowest most leaves. Splash from watering and rain can re-infect the shrub. Removing the lower leaves also improves air circulation which is important for a healthy rose. Remember when spring pruning to remove canes that grow toward the center; again, the point is to open up the bush to sunlight and air circulation.